At short notice my brother and sister in law organised a long weekend in France for Easter weekend. Everything was swimmingly on track right up to the point we were queuing in the car ready to board the Seafrance ferry on Good Friday. The Seafrance crew called a short notice strike. Andrew sorted out a new booking for us on the Norfolk Line and it ended up taking us nearly 11 hours door to door by the time we arrived in Montrieul-sur-Mer. M-s-M is a dear wee French town in Normandy, very near Calais and a key stop for the mail coach between Calais and Paris in the pre car / train era. This town impressed Victor Hugo so much in the 1835 that he made it one of the settings in Les Miserables. For a short period Jean Valjean was the mayor of Montrieul. d) pretty rich and substantial (definitely true). e) it is also very heavy and cooked to within an inch of its life. And everything on your plate has a sauce on it. Edward, Andrew and I had lunch on Saturday at Le Darnetal which is a very traditional local restaurant. I personally found it very tasty yet somewhat overwhelming. The kind of food where you want to nap for the rest of the day afterwards. We all ordered one of the three course set menus. 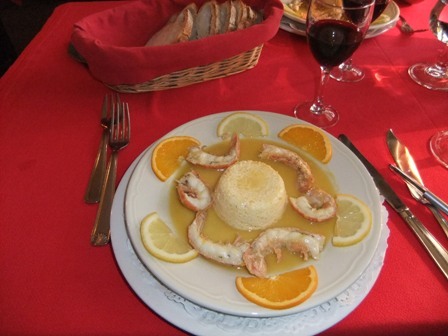 Edward and I both had the Langoustines au Beurre d’Orange as a starter. I would describe this as teeny tiny, super fresh langoustines in a puddle of orangy butter. Very tasty. The minor shock was some form of a mousseline in the centre. It was eggy and very slightly fishy but fairly tasteless. I could have done without it. This was followed by Filet de Boeuf aux Duex Poivres, Setchuan and Mignonette (for Edward). You can translate this as two pieces of beef fillet each covered in a different creamy pepper sauce. And the Confit de Canard Rôti et Magrat Poêlé au Miel et Sesamé (for Andrew and myself). This was a very rich confit duck, with some roast slices of duck covered in a creamy gravy with sesame seeds in it. Of the two I much preferred the beef which was tender and delicious and not quite as overwhelming as the duck. We weren’t planning on dessert but in the end couldn’t resist the Crème brulee and a Café Crème. I didn’t manage to make it through mine but it was pretty much what you would expect. 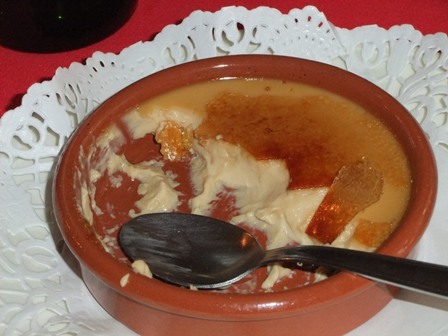 Note the flatter ramekins used in France. Overall I would say that the service was great. It feels very typically French. Go there if you fancy napping for the rest of the afternoon, not if you are after something light.